Take the outdoor fun with your friends and family to the next level with Harvil's newest addition to its backyard game sets. The ladder toss game features bright and fun design and colors that will be perfect for your summer get-togethers, backyard plays, and even outings. Each rung is made with sturdy, premium PVC that can withstand practically any weather condition. The whole target is supported by a base consisting of sand-filled pipes that are capped on both ends to prevent the sand from leaking. 2 sets of bolos are also included in this awesome set and the balls are made with super soft rubber for safe gameplay, even for kids! The balls are also connected with a thick rope that helps prevent tangles when thrown. Storage and transport is a breeze as this set comes enclosed is a nylon zip-up bag with handles and a shoulder strap. Soak up the sun and enjoy a fun bonding experience with Harvil's premium Ladder Toss. Enjoy free shipping when you get this set at Dazadi! 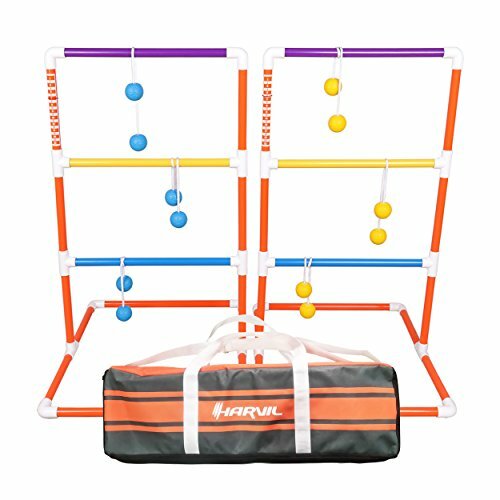 COLORFUL GAME SET PERFECT FOR THE SUMMER - Complete ladder ball game set features colorful targets and soft bolos. Perfect for families or groups and it's even kid-friendly! Assembled dimensions: 27 L x 23 W x 39 H Inches. Weight: 11 pounds. PREMIUM FEATURES WITHOUT THE HIGH PRICE TAG - Target frame is made of sturdy, premium PVC that stays durable even under the sun or the rain. 6 colorful bolos are included in the ladder ball set (3 blue, 3 yellow). The balls are made with soft rubber and are connected with tangle-proof thick rope. STEADY BASE FOR MAXIMUM PLAYABILITY - Base is filled with sand to add weight and stability to the whole frame. Both ends of the targets are capped to prevent the sand from leaking. PORTABLE AND HASSLE-FREE STORAGE - All parts and accessories of the game set are contained in a nylon zip-up carry bag with handles and shoulder strap. THE DAZADI MONEY BACK GUARANTEE & WARRANTY - Your set will arrive with all the necessary parts, without defect and/or shipping damage. We'll ship new replacement parts or an entire replacement table for free. If you still aren't satisfied, we'll give you a full refund. All our items ship for free to your door, but we also offer in-home delivery and assembly for an added fee. During the warranty period, we shall repair or replace defective parts at no cost to the purchaser.